Chase Freedom cardholders can earn a total of 10% cash back on up to $2,500 in combined hotel and car rental purchases made through the Chase Ultimate Rewards travel portal in July. While purchases must be made by July 31, 2016, travel can be booked for any time. 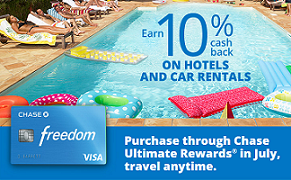 It’s important to note that this offer is only good for hotels and car rentals made through ChaseUltimateRewards.com with your Chase Freedom card. And you’ll need to pay with cash, not points, in order to qualify for the extra bonus. One other thing to note is that since the bonus posts as Ultimate Rewards points, the effective value of the bonus should be more than 10% for those with the Chase Sapphire Preferred card or the Ink Plus Business card. During the promotional period of July 1 to July 31, 2016, earn an extra 9% cash back on up to $2,500 in combined hotel and car rental purchases made through Chase Ultimate Rewards® using your Chase Freedom card. 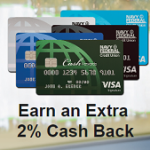 The bonus cash back earned is in addition to the 1% cash back you earn on all purchases for a total of 10% cash back, which means you can earn up to $250 total cash back ($25 cash back plus your $225 bonus cash back). Bonus cash back will post to your account within a week of the transaction posting, and will appear on your monthly credit card billing statement and be available for use within 1-2 billing cycles. To qualify for this promotional offer, account must be open and not in default at the time of fulfillment. This promotional offer is non-transferable. For more information about your rewards program, see your Rewards Program Agreement. For more information or to book your travel, see this link.